Orange is a secondary color, created when you combine two primary colors—red and yellow. Orange is what red and yellow can do when they combine efforts. If you paint only with red, you will get what only red can do. If you paint only with yellow, you will get what only yellow can do. But when you paint with red and yellow, you’ll get new possibilities, fresh solutions, vibrant outcomes. We believe the warm heart of the family can be represented by the color red, and the bright light of the church can be represented by the color yellow. 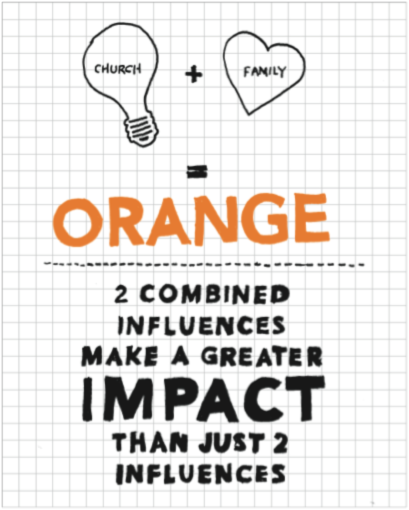 When these two entities combine their efforts for the sake of the spiritual growth of the next generation, the result is Orange.